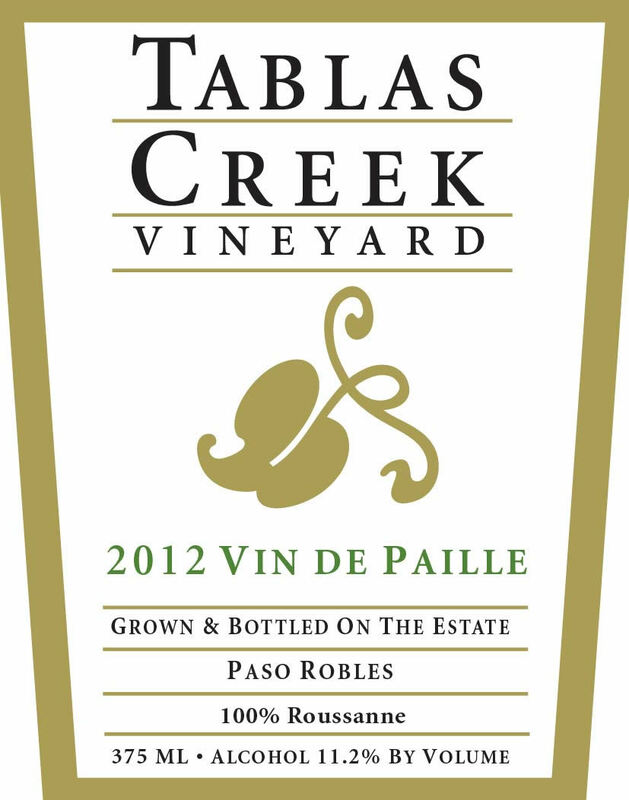 The 2012 Tablas Creek Vineyard Vin de Paille is Tablas Creek’s fifth bottling -- but our first since 2006 -- of this traditional Mediterranean technique for producing dessert wines. Ripe grape bunches are carefully laid down on straw-covered benches in our greenhouses, and allowed to dehydrate in the sun. When the grapes reach the desired concentration, we press them and move the juice to oak barrels for fermentation. The juice ferments until it reaches an alcohol level where the sweetness of the juice is balanced by the acids and mineral characteristics of the wine itself. The 2012 Vin de Paille has a beautiful nose of yellow pear, peach syrup, mint and lavender. In the mouth it's sweet and luscious, with flavors of spiced apples, nectarine and marmelade , balanced by vibrant acids that linger on the long, clean, juicy finish. We expect it to age gracefully in bottle for a decade or more. The 2012 Vin de Paille is made from Roussanne grapes that were grown on our 120-acre certified organic estate vineyard. The 2012 vintage was a classic Paso Robles vintage, warm and sunny, but with above-average yields thanks to average winter rainfall and the frost-reduced 2011 crop. Despite the warm summer, ripening was slowed due to the healthy crop levels, and harvest at a normal time starting in early September and finishing in late October. The resulting wines showed lush, juicy fruit, balanced by good acids, and should provide enormous early appeal. Our Roussanne was harvested between September 7nd and October 22nd. The wine, after pressing, was aged in new French oak barrels for 9 months before being bottled in April of 2014.